The adjuvant ASSIST M36 (replaces Hasten) is an emulsifiable esterified rapeseed oil which improves the performance of many pesticides. SURfaPLUS has developed applications of ASSIST M36 with several insecticides, fungicides, herbicides and growth regulators. 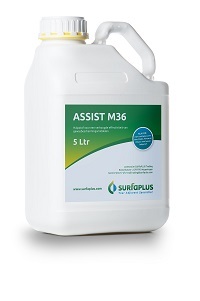 ASSIST M36 enhances the foliar uptake of active ingredients and improves the wetting of difficult-to-wet-crops. It can also reduce the drift of small spray droplets. ASSIST M36 provides a faster control of a pest as more active ingredient reaches its target. As a result, growers can use the label rate of the active ingredient instead of application the double label rate. ASSIST M36 is distrubuted in Denmark. See our Denmark pages. For more information, please contact Hans de Ruiter: h.deruiter@surfaplus.com. The adjuvant ASSIST M36 is one of the best adjuvants for Vertimec Gold. It substantially increases the uptake of abamectin into the leaves of many ornamental and vegetable crops.